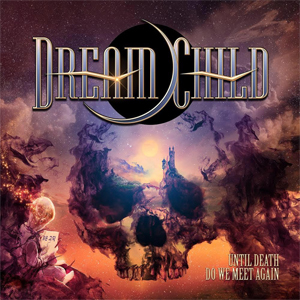 Frontiers Music Srl had previously announced the formation of a brand new band featuring legends of the hard rock/heavy metal scene, DREAM CHILD and today announces the release of their debut album, Until Death Do We Meet Again, scheduled for September 14th release. Today, the first song from the album, "You Can't Take Me Down" is available to hear below. Of "You Can't Take Me Down" Craig Goldy states: "It's about when all the people, circumstances, obstacles and so forth that life can throw at us take a turn for the worst and that no matter what, we can and will prevail!" Pre-order Until Death Do We Meet Again HERE. Craig Goldy says, "The band DREAM CHILD was conceived during a brainstorming session with Serafino (President of Frontiers) one day while discussing other matters over the phone. I mentioned that I had been listening to my favorite bands a lot recently, DEEP PURPLE and RAINBOW's Rising album, among others in that style and had noticed that many people who also love those bands often have the very same comments as one another: "They don't make music like that anymore!" Even though I said that in passing, Serafino asked me a question that would forever shape my future. He simply asked, "Well, can you?" and I said....."YES!!!" During the very first public memorial for our most beloved Ronnie James Dio, I had mentioned that whenever I do start writing original material again that I would utilize everything that I had learned from working side by side with the Master for so many years in such a way that I would hope to make him proud....and here it is! The name is inspired by one of his lyrics on the Dream Evil album and the nickname he gave me at the time, Dream Child! We are so very fortunate to have bassist Rudy Sarzo as a featured guest, Simon Wright on drums, Wayne Findlay on guitars and keyboards, and a surprise vocal discovery from Argentina, Diego Valdez, whose voice will send shivers up your spine!! This album will bring back memories of the days most people have thought were long gone and never to return, yet it is also new and fresh enough to be unique with some unexpected twists and turns!! No more "same old, same old" here, no fillers. Every song is an oasis in the desert and a rare gem in the coal mines of life in this new world that thinks the past greatness of rock would remain in the past. We've brought it back to life once again!! I am very proud of this album and all who have made this become a reality. There are some big names who've lent a hand in the writing and I am amazed at the new and aggressive sound that producer Alessandro Del Vecchio has brought to these songs!!! I hope you all agree...."
"You Can't Take Me Down"
"Until Death Do We Meet Again"
"In A World So Cold"
"One Step Beyond The Grave"